The modern business environment is supported by technology in every function, from HR to PR, and project management is no exception. Internal and external technology underlies almost every project related exchange, and, in many cases, drives project decisions. On the other side of the coin, technology itself is big business- the Consumer Technology Association (CTA) values the tech sector at $351 billion. If you want to rise to the top, and secure a lucrative and prestigious position, you can’t do better than a Master’s in Project Management with an IT Concentration. Most people think of software development when envisioning IT project management, but there are a range of other prestigious and lucrative careers open to professionals with this degree. Other top positions in IT management include Chief Technology Officer, Director of E-Commerce, UT Project Manager, and Internet Technology Strategist, all of which, according to the Bureau of Labor Statistics, command average salaries of $120,000 and up. A degree which fuses the fields of Project Management and IT can take the form of an IT Management Master’s Degree with a Project Management Focus, a Master’s in IT Project Management, or a Master’s in Project Management with an IT Concentration. Such programs aim to equip graduates to think both in terms of technological analysis and business strategy, and to act as tech-savvy leaders and managers of staff within their organizations. Coursework usually includes topics like Management of Information Systems, IT Project Planning, and Information Technology Systems Development. A Master’s in Project Management with an IT Concentration frequently includes coursework designed to prepare students to sit for the Project Management Professional (PMP) certification exam or one of several ITR certifications, and may include an experimental learning component or capstone project to develop and showcase workplace skills. Before taking the plunge and enrolling, you’ll want to find the very best Master’s in Project Management with IT Concentration program- one which delivers value, flexibility, and academic quality. Our ranking of the 10 Best Master’s in Project Management with IT Concentrations is based on a thorough survey and analysis of the top online master’s programs in the field, ranked for affordability, flexibility, and academic quality, as measured by the metrics below. Flexibility: The number of specializations, accelerated courses, start dates, and other features granting flexibility for the student. Class Size (1/3): Average undergraduate student to faculty ratio. Graduation Rate (1/3): Percentage of students completing program requirements and graduating on time. Grantham University is a private institute which is based in the town of Lenexa, Kansas and provides education services exclusively online. The university got its start in 1951 as the Grantham Radio Licensing School, with the goal of training WWII veterans for Federal Communications Commission License certification, preparing them for a successful transition to the civilian workforce. The school was originally based in Los Angeles, California, and moved to Slidell, Louisiana in 1990. The campus was severely impacted by Hurricane Katrina in 2005, prompting the school’s move to its permanent headquarters in Kansas. Today, Grantham conducts all classes online, awarding online degrees at the associate’s, bachelor’s and doctoral levels, as well as certificates and continuing education. The notably diverse student body totals 17,486, and is made up mostly of non-traditional learners enrolled in career-focused degree programs like nursing, engineering, computer science, and criminal justice. Grantham is known for offering affordable student-centered distance education, and for providing excellent service to military and veteran students, in keeping with the school’s original mission. Grantham has been recognized for 10 consecutive years as a Top Military Friendly School by Military Advanced Education and Transition, a Military Friendly School by GI Jobs for the past nine consecutive years, and a Military Times Best College for the past 5 consecutive years. Grantham University awards a remarkably flexible and affordable online Master’s in Information Management- Project Management. The program is focused on integrating information technology applications with project management principles drawn from the Project Management Institute’s A Guide to the Project Management Body of Knowledge (PMBOK) Guide, and has been reviewed and approved as a Registered Educational Provider of the Project Management Institute (PMI). The academic and practical the skills covered in the program will prepare graduates to pursue certification as a Project Management Professional (PMP). The curriculum of the online master’s in project management with a concentration in IT was developed consists of 37 credit hours, with courses such as Project Management Organization Framework and Risk, Management of Information Systems, Managing in an Age of Information Technology Change, and Information Systems Strategic Planning. The program culminates in a project management IT capstone. Students can earn their online master’s degree in as little as 24 months, take advantage of weekly start dates. Tuition is priced at $325 per credit and 88% of students receive financial aid, putting Grantham ahead of any other school in our top Ten ranking on both affordability measures. Members of the United States Army Warrant Officers Association receive an even more affordable rate of $250 per credit. With a winning combination of flexibility, affordable tuition, and strong academics, Grantham deserves the top placement in our ranking of 10 Best Master’s in Project Management with IT Concentrations. Colorado Technical University (CTU) is a private technical institute which is based in Colorado Springs, Colorado. The university was founded in 1965 as Colorado Technical College, with the aim of training veterans in technical and vocational subjects. In 1995, the school achieved university status, and began offering online classes. The university has been twice ranked by Military Times as #1 Best for Vets in Online and Non-Traditional Universities, and currently serves some 92% of its 25,797 students, mostly working professionals and active-duty military members, fully online. Online degrees are awarded in a variety of career-focused and technical subjects, and classes are engaging and student-centered, offered through archived lectures, live chat, and video. Popular areas of study include criminal justice, engineering and business. CTU offers an affordable online master’s in Information Technology – Project Management. This affordable and comprehensive online degree is designed to prepare future IT project managers to execute IT projects on-time, within budget and with high-quality standards, through advanced training in professional project management networking technologies, equipment and software. The degree requires the completion of 48 credit hours, and incorporates studies in strategic management, project management, network infrastructure management, enterprise system architecture, systems security management, and enterprise data management technology. The course of study is made up of 12 classes, with such titles as Information Technology Systems Development, and Project Planning, Execution and Closure, followed by a Project Management Capstone. 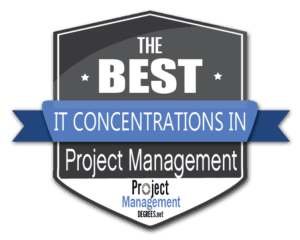 This high-quality project management in IT master’s program has been ranked by U.S. News & World Report among the best online graduate computer information technology programs for four consecutive years, and is accredited by the PMI Global Accreditation Center for Project Management Education Programs (GAC). Tuition is very affordable at $585, and a full 71% of students receive financial aid. 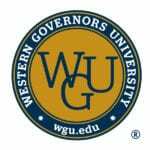 Western Governors University (WGU) is a private, not-for-profit institute which is based in Salt Lake City, Utah and delivers all classes in an online format. The proposal for the school was first put forth by the governor of Utah in 1995, with the idea of establishing an innovative, multi-state online education network to serve working adults. Two years lated, the school was established with the support of 18 other state governors, and named for the founding group. WGU continues to fulfill its mission of delivering quality distance education, and has a total enrollment of 78,709 non-traditional learners. WGU is notable for affordable tuition, flexible delivery, and student-centered education, which features extensive academic supports. All students are assigned a faculty, who words with them to develop and follow a personalized Academic Action Plan, and who provides academic advising, coaching, and serves as the student’s school liaison. Courses are assessed and scheduled with maximum flexibility in order to accommodate students, almost all of whom are over the age of 25 and employed full-time, while pursuing associate’s, bachelor’s or master’s degrees on a part-time basis. Western Governors University awards a fast and affordable and fast online master’s degree in Information Technology Management which includes PMI Certified Associate in Project Management (CAPM) certification. The program incorporates training in Project Management, Information Technology Management, Technical Communication, Technological Globalization, Managing Technology Operations and Innovation, and IT Sourcing and Development in a Global Economy. Some 93% of students earn their online degree from WGU in 6 months to two years, thanks to the school’s competency-based learning model, which allows students to test out of requirements by demonstrating their knowledge on aptitude exams, rather than by accruing classroom time. Under WGU’s generous transfer credit policy, students can further accelerate their rate of completion, transferring in an average of 32 credits from previous coursework. Fast learners can save not only time but money as well; the university bills tuition as a flat rate of $375 per semester, so those completing more than one course per semester will pay less tuition overall. With a full-time student retention rate of 74%, WGU has the third-highest retention rate of any school surveyed for our ranking of Best Master’s in Project Management with IT Concentrations. Purdue Polytechnic Institute is one of ten college divisions of Purdue University, a large and prestigious public research university which the flagship campus of the Purdue University system. Purdue Polytechnic Institute is one of the nation’s largest technology schools, with a total enrollment of 6,120 undergraduate and graduate students. It encompasses seven academic divisions, including colleges of Aviation and Transportation Technology, Construction Management Technology, Computer Graphics Technology, and Computer and Information Technology. The Polytechnic division of Purdue dates back to 1964, when it was established as the Purdue School of Technology. The division adopted competency-based learning methods in 2015, and was subsequently renamed as Purdue Polytechnic Institute. Today, the Polytechnic Institute is tied for first place in engineering education rankings, and awards more engineering technology degrees to women than any other school in the nation. Purdue University, as a whole, also boasts elite rankings and recognitions. The Carnegie Foundation ranks Purdue among the country’s most research-active campuses. U.S. News and World report ranks Purdue 56th in National Universities, 18th in Top Public Schools,12th in Most Innovative Schools, and 74th in Best Value Schools. Purdue University confers an affordable online master’s in IT Project Management. This respected online degree program is based around the PMBOK guide, and covers studies in project management requirements, discovery and management, schedule development and management, portfolio management, and management of outsourced resources. Graduates will be well-prepared to successfully pass the Project Management Professional (PMP) Certification exam, and the curriculum even includes an optional PMP Certification exam prep course. Classes are delivered in an eight-week format, and the entire program can be completed in as little as one year. The course of study comprises 34 credit hours (30 for those with PMP certification, and includes such classes as IT Quality Management, Project Estimating, Scheduling, and Control, IT Policy, Law, and Ethics, and IT Security Management. Students learn through a flexible combination of asynchronous video lectures and live streaming video, viewing the same lecture content as on-campus Purdue students. This prestigious degree comes at a relatively affordably price of $775 per credit, and boasts the highest academic quality score of any school included in our ranking of Best Master’s in Project Management with IT Concentrations, with very small class sizes, and exceptionally high rates of student retention and graduation. DePaul University is a private, Roman Catholic school which is based in Chicago, Illinois. DePaul was founded by Vincentian monks in 1898 with the aim of educating the Roman Catholic children of Chicago’s immigrants. The school was among the first Catholic universities to admit female students, becoming co-educational in 1911. Today, DePaul continues to serve the immigrant community by offering affordable tuition and recruiting first-generation students and others from disadvantaged backgrounds, and boasts a student body which is highly diverse in ethnicity, religion and nationality. It is the state’s largest private university, and the nation’s largest Catholic university, with a total enrollment of 23,110 students pursuing degrees at the undergraduate, graduate, and doctoral levels. The school has robust academics and stresses hands-on learning; almost half of students complete an internship during their enrollment. U.S. News and World Report ranks DePaul 124th in National Universities and 70th in Best Value Schools. DePaul University offers an online master’s in IT Project Management which is flexible, respected and rigorous. The program is based around the study of the latest project management methodologies, and incorporates risk management, procurement, contract management, time and cost estimating, organizational change management, and stakeholder management. The course of study consists of 52 credits, including an IT Project Management Capstone Course, and no less than 24 credits in electives, allowing for a high degree of personalization. Classes in the online degree program include Information Technology Leadership, Collaborative Technologies for Leading Projects, Information Technology Investment Financial Analysis, and Enterprise Project Management. Class sizes are very small, with a student to faculty ratio of just 15 to one, and the university has very high rates of graduation and student retention, resulting in our second-highest overall academic quality score. Tuition is priced at $1,060, and no less than 81% of students receive some form of financial aid, the second-highest rate of any school in our Master’s in Project Management with IT Concentrations ranking, making this online project management degree an excellent investment. Sullivan University (“Sullivan”) is a private institute located Louisville, Kentucky, with 6 campuses and extension sites throughout the state. The university dates back to 1962, when it was established as a one-year career-preparation institute with a class of 300 students. Today, Sullivan is the largest private university in Kentucky, serving a total of 6,000 students in associate’s, bachelor’s, master’s and doctoral degree programs spread through 10 academic divisions. The school emphasizes workplace-relevant education, and popular areas of study include early childhood education, hospitality, computer technology and nursing. Sullivan’s distinctive culinary program includes a student-staffed, professional restaurant. Both faculty and students at Sullivan have been featured on the Food Network, and Sullivan’s is the only culinary program in the country to have been formally invited to cook for the athletes and sponsors of the 2008 Olympics in Beijing. Sullivan University confers a fast and flexible online master’s degree in Managing Information Technology. The program blends business and IT studies, and aims to prepare graduates to integrate conceptual knowledge, practical skills and analytical thinking to research, support and execute IT project management decisions. The course of study consists of 48 credits, and includes a Management Experiential component, a free elective class, and integrative Capstone Course. Coursework includes Project Management, Information Systems Development, Electronic Commerce and Intranet Development, Data Mining, and Leadership and Team Development. This fast-paced program can be completed in as little as 18 months. Students enrolled in the online IT Project Management master’s program enjoy extensive and flexible academic services. Support services available for distance learners include academic advising, library resources, career assistance and a student mentoring team. Tuition costs an affordable $590, and 69% of Sullivan students receive financial aid. Class sizes are remarkably small, thanks to a student to faculty ratio of 13 to one, the second-lowest in our entire ranking of 10 Best Master’s in Project Management with IT Concentrations. 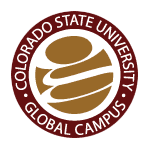 The Colorado State University–Global Campus (“CSU-Global”) is a public university belonging to the public Colorado State University System, which is headquartered in Greenwood Village, Colorado and delivers online degree programs to distance learners. The school was launched in 2007, with the goal of providing high-quality education to adult distance learners, and became in independent university within the Colorado State University System in 2009, and the CSU Global therefore calls itself “the first statutorily-defined, non-profit, online state university.” Today, the university offers 14 bachelor’s degree programs with 25 bachelor’s degree specializations, as well as 12 master’s degrees. All undergraduate programs are degree-completion programs, wherein students who have previous college course credits, life and work experience, CLEP and military credits can apply their knowledge and credits towards earning a bachelor’s degree. The Colorado State University–Global Campus offers an online master’s in information technology management with a specialization in project management. The program is designed to prepare graduates for a variety of leadership roles in high-tech environments through studies in global perspectives, leadership tools, and practice in the planning and efficient implementation of IT operations to meet business goals. The Master of Information Technology Management program consists of 8 three-credit core courses, including Management Enterprise Resources Planning (ERP) Systems, Ethical Considerations in Managing Information Technology, and Information Technology Auditing and Assurance. The Project Management Specialization is based on the professional standards put forth by the Project Management Institute (PMI), and includes content covered in the Certified Associate in Project Management (CAPM)® and Project Management Professional (PMP) exams. In addition, the online master’s in information technology program’s curriculum integrates preparation for several IT certifications, and the IT department’s partnership with CompTIA includes discounts for CSU Global students on any CompTIA certification exam. Tuition is priced at an affordable $500 per credit. American InterContinental University (AIU) is a private university which is headquartered in Schaumburg, Illinois, and operates campuses in Houston, Texas, and Atlanta, Georgia, as well as an online campus priding distance education. The school was founded in 1970 by an American couple in Lucerne, Switzerland, as the American Fashion College of Switzerland. The school soon added business classes to its fashion programming, and eventually assumed its current name and breadth of offerings by 1996. Today, ACU serves over 15,000 students, some 80% of whom are enrolled exclusively in online degree programs and classes through ACU Online. The school’s online campus was included in Computerworld Honors Program’s “Best of the Best” in 2009. The university offers associate, bachelor’s, and master’s degrees in business, healthcare management, criminal justice, education, IT, and media production, and has an open admissions policy. American InterContinental University offers a fast-paced Master of Science in Information Technology (MSIT) Degree with a Specialization in IT Project Management. This online master’s degree in IT project management is up-to-date and workplace-relevant, and integrates studies in project management, strategic information systems management, enterprise network infrastructure and information-systems building blocks. The course of study consists of 48 credits, 24 in the IT core and 24 credits in IT project management, including courses such as Principles of IT Project Management, Leadership, Management, and Communication of Technical Projects, Project Quality Management, and Risk Management. Online students benefit from access to a Graduation Team, consisting of an Admissions Advisor, Financial Aid Advisor, Faculty Advisor and Student Advisor. Tuition costs $600 per credit, and 70% of students are awarded some form of financial aid. The University of Maryland University College (UMUC) is public, not-for-profit institute which is based in Adelphi, Maryland, and operates satellite campuses throughout the Baltimore-Washington Metropolitan Area, and across Maryland, as well as in Europe, Asia, and the Middle East. It is one of eleven members of the University System of Maryland. UMUC got its start as an evening program for adult learners operated by the University of Maryland in the 1920s. The popular adult education program became the College of Special and Continuation Studies in 1947, and a fully-independent institution in 1970. The unusual name of “University College” is traditional to the British college classification system, and refers to the historical relationship of the school (which is a traditional, four-year college) to the University of Maryland. UMUC is widely known for its popular online degree programs, and is one of the world’s largest providers of distance education. The school’s total enrollment is greater than 90,000 worldwide. Of the many UMUC international campuses, the majority are situated on military bases serving active duty military personnel, and school offers military students a range of supports including credit for military experience and training, and assistance in navigating military education benefits. The college has an open admissions policy and administers some 120 academic programs, including certificates, associate’s, bachelor’s, master’s and doctoral degrees. The University of Maryland University College awards an online Master’s in IT with a Project Management Specialization. The program provides in-depth instruction in IT project management skills, while preparing students to become certified in project management, through studies in project risk management, project procurement management, and project management methodologies, along with training in IT skills and leadership. The curriculum is comprised of just 36 credits, of which 6 may be transferred in from approved prior coursework. Classes include Computer Systems Architecture, Information Technology Project Management, and Quantitative Methods in Project Management. No capstone or internship is required. The UMUC Master of Science in Information Technology specialization in Project Management is accredited by the Project Management Institute Global Accreditation Center for Project Management Education Programs. The UMUC project management IT degree curriculum includes preparation for the PMI Certified Associate in Project Management (CAPM) certification and PMI Project Management Professional (PMP) certification exams. Tuition is priced at an affordable rate of $659 per credit, and class sizes are relatively small, with a student to faculty ratio of 20 to one. The University of Liverpool is a public research university located in the city of Liverpool, England. The university was first established as a college in 1881, has been the home of many innovations and discoveries, including the world’s first public radio transmission, the first surgical X-ray in the United Kingdom, the discovery of the synapse, and that country’s third oldest university press. In more recent times, university engineers, physicists and technicians contributes to the construction of the CERN Large Hadron Collider. Liverpool was a founding member of the Russell Group, the N8 Group for research collaboration. Total enrollment comes to 27,070, and the university offers 230 first degree courses across 103 subjects. University faculty and alumni have included no less than nine Nobel Prize winners. This illustrious school is included among the top 1% of universities worldwide by the Academic Ranking of World Universities (ARWU) and ranked 129th in Best Global Universities and 14th in Best Global Universities in the United Kingdom by U.S. News and World Report. The University of Liverpool awards an elite online Master’s in Project Management with a specialization in Information Technology. The curriculum consists of six core modules, two IT Project Management specialization modules, a Personal Development Portfolio and culminates in a research-based dissertation or professional consultancy project. The first module lasts 12 weeks, while the remaining modules lasts just 8 weeks. Courses include Project and Portfolio Management in Organizations, Managing Successful IT projects, and Tools and Techniques for IT Projects. The Master’s in IT project Management program has been approved as a provider of project management training by the Project Management Institute (PMI) and accredited by the Association to Advance Collegiate Schools of Business (AACSB). All online degree program coursework stresses collaboration, in keeping with the team-based nature of project management, and group work accounts for as much as 50% of each student’s grade. For such an elite institution and high-quality degree program, the tuition for the Liverpool IT project management master’s is surprisingly affordable at $1,000 per credit.